Mate, just check your Rnd Start and Rnd ends for your colour legend for Stress and Trauma. Edit : Ignore me… standard forms… I get it now. I will post updated rates Tuesday evening as usual. Next game is Saturday late afternoon - so team expected and investment closures is expected Thursday evening. Although with every one locked in except @Scintilla and @dingus it will be a quiet week on the trading floor. Good luck with your rates this week. Lots of poor performers in the AFL, and good performers in the VFL. Interesting decision to be made by a conservative “if it’s broke don’t fix it” selection panel. Serious suggestion: Can I propose that the source of the best players be one that has an actual farking clue about the sport? Yes - who do you suggest? We had a bit of discussion about this last year. AFL bests are lazy and obviously biased towards higher stats and bigger name players, but the EFC site uses them as well for its reports/best players. As well as “validity” other issues are timeliness and reliability - i.e. to always have best player reports every round and by sunday night at the latest. I don’t want to spend a lot of time hunting for reports or changing source every week. 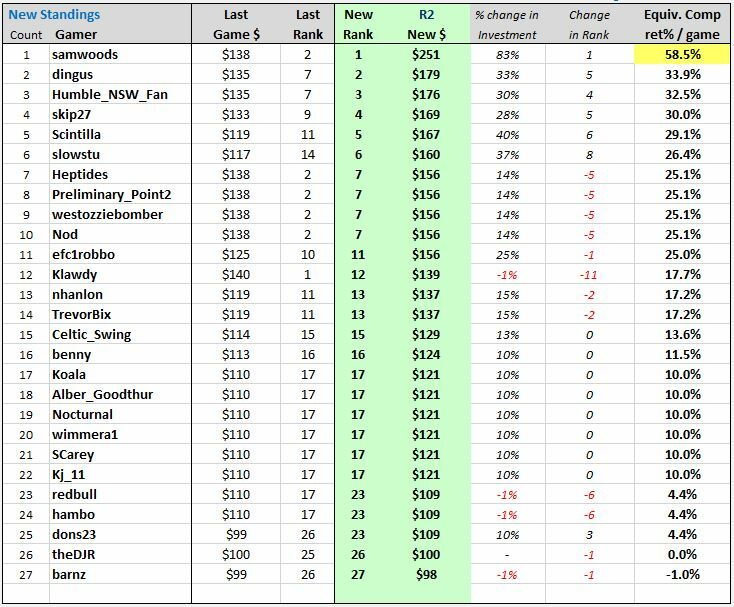 The best player payments aren’t ever big enough to make much difference to overall standings, they might occasionally change 1 or 2 ranking places only. So a bit of randomness to a couple of the usually 6 bests doesn’t hurt too much. Particularly because best player payments are staggered so more money goes to Gamers at the bottom of the table. Happy to consider any alternatives anyone wants to propose. Admittedly, they’re all subject to quirks. I’m possibly being overly thorough in my aversion to that organisation having any further influence on how I interact with football. Is there actually a respected football publication left? Does Titus O’Reilly publish bests? The problem with Nobby votes is that one could influence the other. Whoa! Are you suggesting that the fine people of Blitz would deliberately skew their votes to gain an advantage in a panic dollar competition? I mean, I know I would, but surely others are better than that? There is wisdom in most crowds. However, the delay in Nobby is one thing, but I would be more concerned with personal agendas - votes for lovechilds v none for whipping boys distorting the count. While true, this would be a constant for all players. 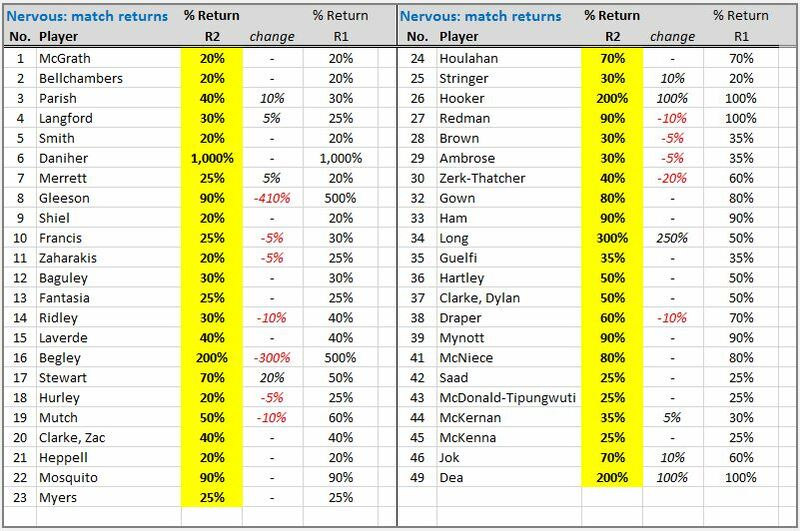 Here are Nervous Rates for R2 v St.Kilda. Lovin’ the extra 5% for Zerrett. All available funds on Darcy “Darcy” Parish please chief. I don’t have a problem with last weeks best. stop whinging. @Scintilla is only Gamer who can still change their investment for this round. You presume correctly, on a number of levels. Plunge on Parish has pays off for those with free funds. Ridley out is carnage for many Gamers. Of the 32 locks put in place in R1, 14 ( or 43%) have already failed by week 2. If the Team plays as selected the draft standings will be similar to the following table. (Note: there will be minor changes for win jackpot, best players bonuses which have not been included). 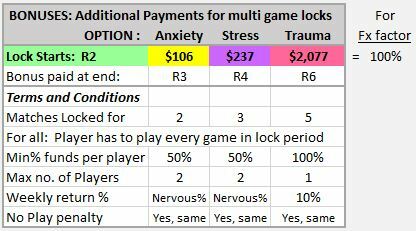 New Gamer @Scintilla has 2 weeks to investigate why 100% anxiety or stress investments are not the best choice. Colonel I realise the rules, but I don’t suppose there’s any prospect of getting some kind of relief from my Parish trauma lock on the grounds that the match committee was (and has proven to be) completely farking stupid for leaving him out last week is there?